The latest tourist arrival figures have been released and they show increased in both the overnight and cruise sectors. Cruise tourism had the strongest showing: up 22% from the same period last year - meaning that 322 thousand cruise visitors came in the first three months of the year. March alone was up 39% from the previous year. 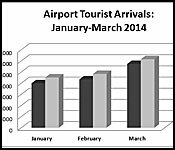 There was a 10.25% increase in airport arrivals for those first three months, and in line with that arrivals of overnight tourists went up by 9.67%, compared to 2013. The BTB reports that overnight arrivals in the first three months of 2014 have all exceeded 30,000 visitors culminating in a total of 101,982 guests at hotels. The largest number of travelers to Belize continues to come from the U.S, whose number of visitors has increased by 11%. There is other good news in the industry. 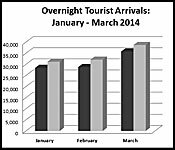 The Belize Tourism Board is reporting that arrivals for overnight, cruise and airport visitors went up between January to March 2014, when compared to the same period last year. In respect of airport tourist arrivals, there was a ten percent increase for visitors arriving at the P.G.I.A., which totals to over seventy-seven thousand visitors in the first three months of the year. For overnight tourism, the number went up by nine percent compared to the same period last year. 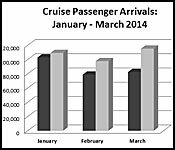 It was cruise ship passenger arrivals, however, that registered the greatest increase. The numbers shot up by twenty-two percent in the first few months of this year. All in all, there have been a total of over three hundred and thirty-two cruise passenger arrivals in the first quarter. According to the Belize Tourism Board (BTB), overnight arrivals have increased by an average of 9.67% over the first three months of 2014, while more than 300,000 cruise ship visitors came to Belize for an increase of 22%. Tourism numbers have been almost consistently on the rise for several years now and president of the Belize Tourism Industry Association (BTIA) Herbert Haylock, who spoke with us at the Belize Tourism Expo on Friday, said that the increases, which they hope to maintain, come from the collective promotion of the destination by the many persons involved. The work started at the Expo continues on a one-on-one basis between operators and agents, he noted. But with so many visiting Belize, and in view of the ongoing debate about cruise tourism’s place in the tourism sector and Belize’s development generally, where can the balance be found, so that today’s cruise tourists become much more? The BTIA has been cautious in its discussion, especially with regard to the Stake Bank and Harvest Caye initiatives, and President Haylock reiterated that there is a place for cruise tourism, but it must be carefully managed. The Sustainable Tourism National Plan prefers that it be centered in Belize District and particularly Belize City, with limited visits to the South. Whether this will be followed is anyone’s guess.